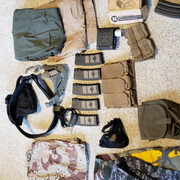 Looking to sell some airsoft equipment. All are in great working order and a couple are practically new. I'll post pictures later this week. I will be at Bangor on 4/27 if you'd like to meet there. 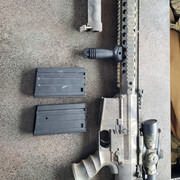 Extra m4/m16 mags: The lot for $45 Otherwise add one to a rifle for $5. 5 G&P midcaps, 1 unknown brand metal midcap, and 2 highcaps. Offer up for the rest of the gear.